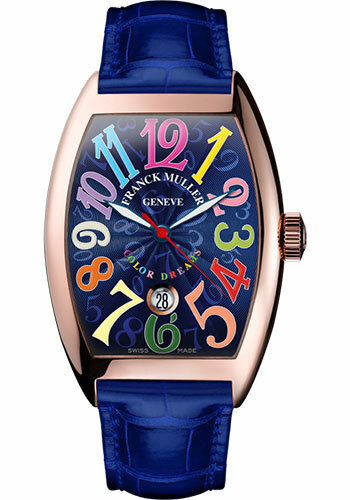 43.30 mm x 60.50 mm 18K rose gold case, blue dial with Color Dreams Arabic numerals, automatic movement with hours, minutes, central seconds, and date at 6 o'clock, approximately 42 hours of power reserve, blue leather strap. Water resistant to 3 atm. 43.30 mm x 60.50 mm 18K rose gold case, white dial with Color Dreams Arabic numerals, automatic movement with hours, minutes, central seconds, and date at 6 o'clock, approximately 42 hours of power reserve, black leather strap. Water resistant to 3 atm. 43.30 mm x 60.50 mm 18K rose gold case, white dial with Color Dreams Arabic numerals, automatic movement with hours, minutes, central seconds, and date at 6 o'clock, approximately 42 hours of power reserve, brown leather strap. Water resistant to 3 atm. 43.30 mm x 60.50 mm 18K rose gold case, white dial with Color Dreams Arabic numerals, automatic movement with hours, minutes, central seconds, and date at 6 o'clock, approximately 42 hours of power reserve, orange leather strap. Water resistant to 3 atm. 43.30 mm x 60.50 mm 18K rose gold case, white dial with Color Dreams Arabic numerals, automatic movement with hours, minutes, central seconds, and date at 6 o'clock, approximately 42 hours of power reserve, red leather strap. Water resistant to 3 atm. 43.30 mm x 60.50 mm 18K rose gold case, white dial with Color Dreams Arabic numerals, automatic movement with hours, minutes, central seconds, and date at 6 o'clock, approximately 42 hours of power reserve, white leather strap. Water resistant to 3 atm. 43.30 mm x 60.50 mm 18K rose gold case, white dial with Color Dreams Arabic numerals, automatic movement with hours, minutes, central seconds, and date at 6 o'clock, approximately 42 hours of power reserve, yellow leather strap. Water resistant to 3 atm.